I have another tutorial over at the Fat Quarter Shop blog today. The Sewing Machine Accessory Pouch is the perfect spot to keep your sewing machine tools, accessories, and manual so that you can find everything when you need it. 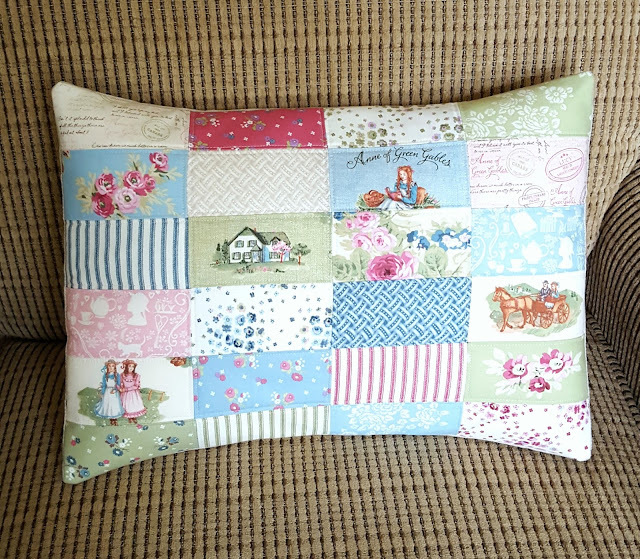 The featured sample above was sewn with Chestnut Street fabric by Fig Tree Quilts for Moda. I love that text print in the background! Here's my first prototype, made with scraps from my own stash. I made the bottom corners round in this version, but otherwise it's the same. It's always fun to see how different prints change the look of things. 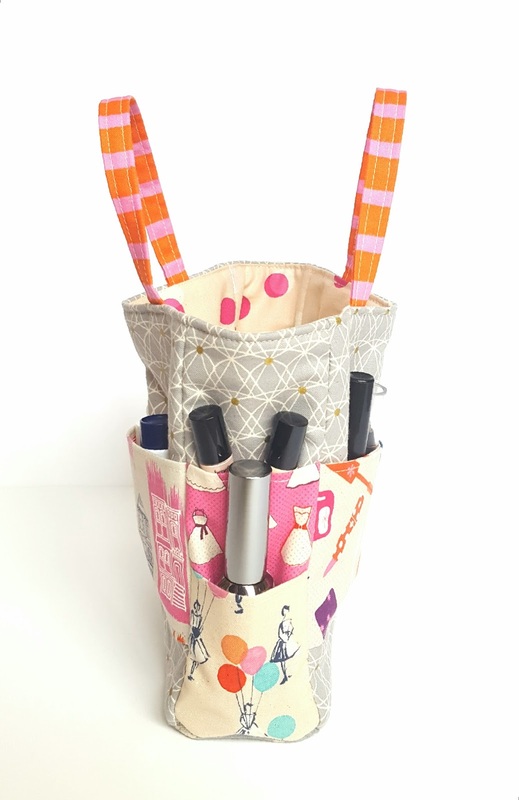 This would also make a great pouch for hand quilting or embroidery projects. 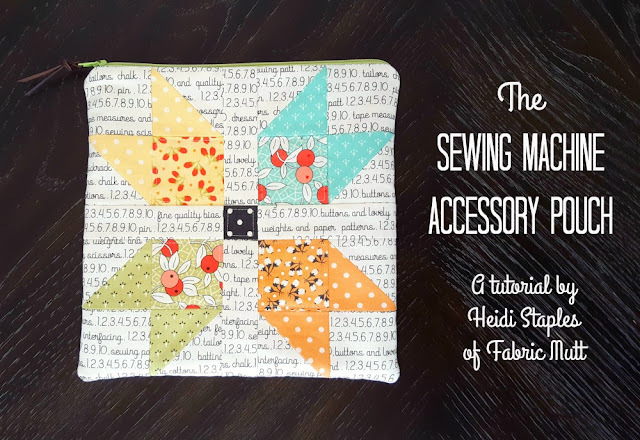 A hoop is easily tucked into the outside pocket while your tools go inside the zipper pocket. 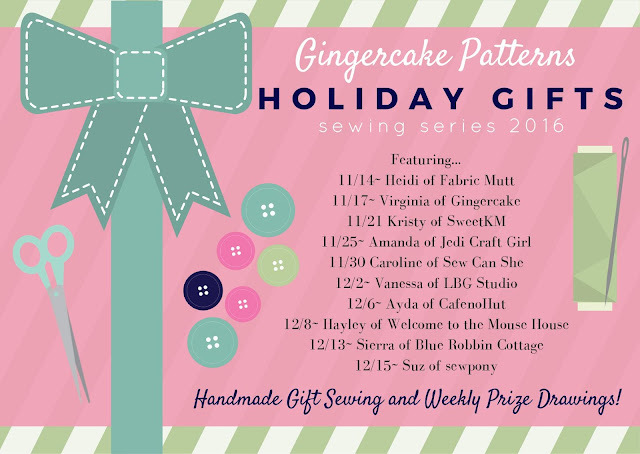 Head over to the FQS blog for the pattern! When you finally make it through the doors of Sample Spree at Quilt Market, it's good to have a plan. I always have my mental wish list ready to go so that I know where to run first. 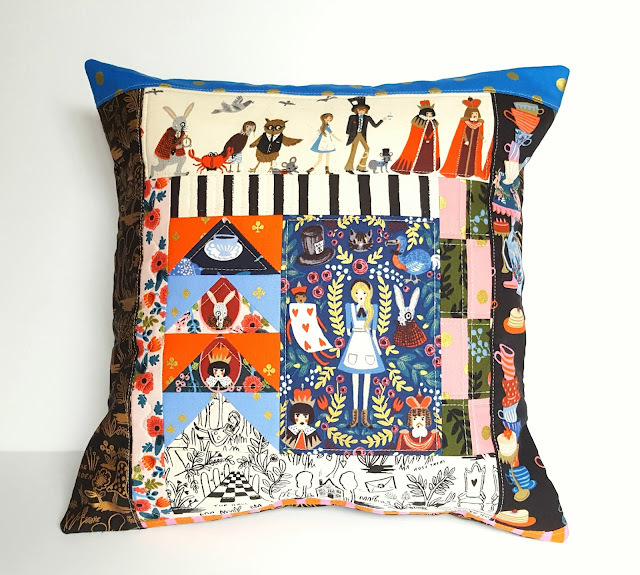 The bundle at the top of my list last month was Wonderland by Rifle Paper Co. for Cotton + Steel. My daughters and I had all fallen in love with the sneak peek on Instagram, and I was so excited to get my hands on the collection. It was the first bundle I opened up once I got home, and it seemed to be just the thing for an improvisational pillow. 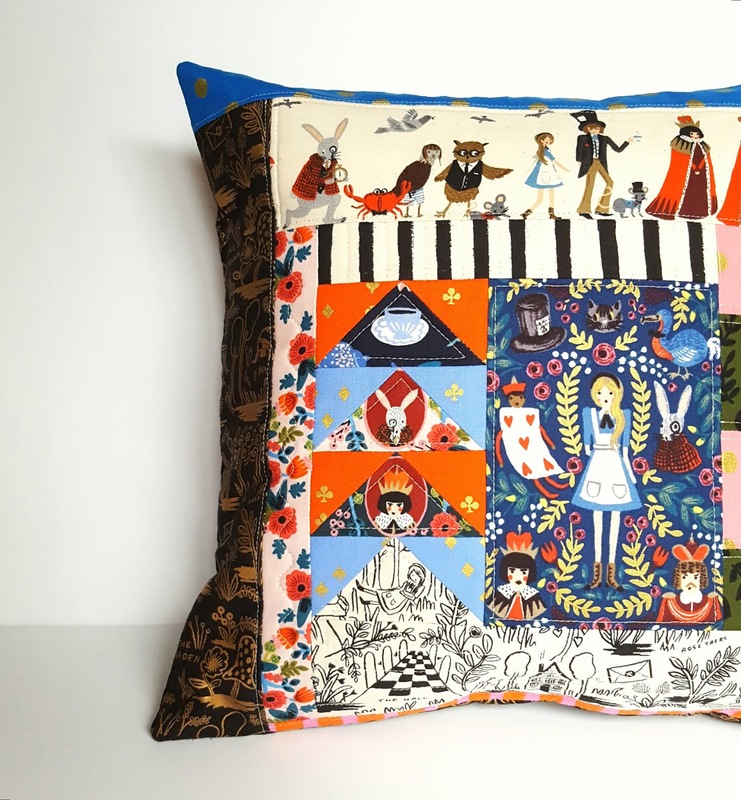 The artwork for these prints is taken directly from Anna Bond's illustrated version of Alice's Adventures in Wonderland, and it's truly stunning. The colors are saturated and the golden accents are lovely, but mostly it's the characters who shine brightest. I love the character prints, the illustrated map prints, the completely charming stacks of tea cups. It's all so beautiful. The pillow design is essentially a log cabin block. 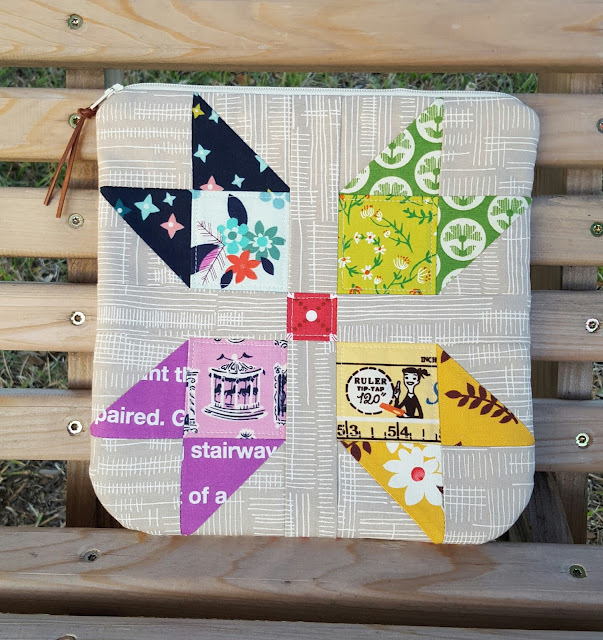 I tossed in a large fussy cut center, a string of flying geese blocks, and a bit of rectangular patchwork along the way. I was going for a sort of "down the rabbit hole" feel, and I think it works. I varied my quilting according to the different sections to add to the randomness of it all. 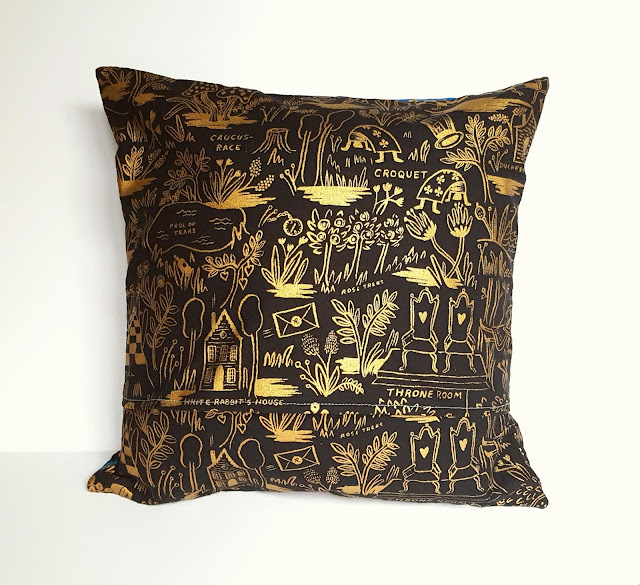 I used black and gold canvas for the pillow backing. Again, this illustrated map print is divine. It's offered in several different colorways on both canvas and cotton, and I'm hard pressed to decide which is my favorite. There are few things more satisfying than pairing the right fabric with the right project, and this was one of those times. It all makes for a pretty happy afternoon of sewing. I love getting new ideas for handmade Christmas gifts, so when Virginia of Gingercake asked me to sew my own version of one of her patterns for her 2016 Holiday Gift Series, I was excited. Her Art Caddy Tote is such a great pattern as written, but the more I looked at it, the more I thought, "Wouldn't this make a fantastic makeup bag?!" Keep in mind that on most days, my makeup routine begins and ends with lip balm. I break out the rest of my beauty stash for special occasions or for church on Sundays, but I still need a place to store it during the week. 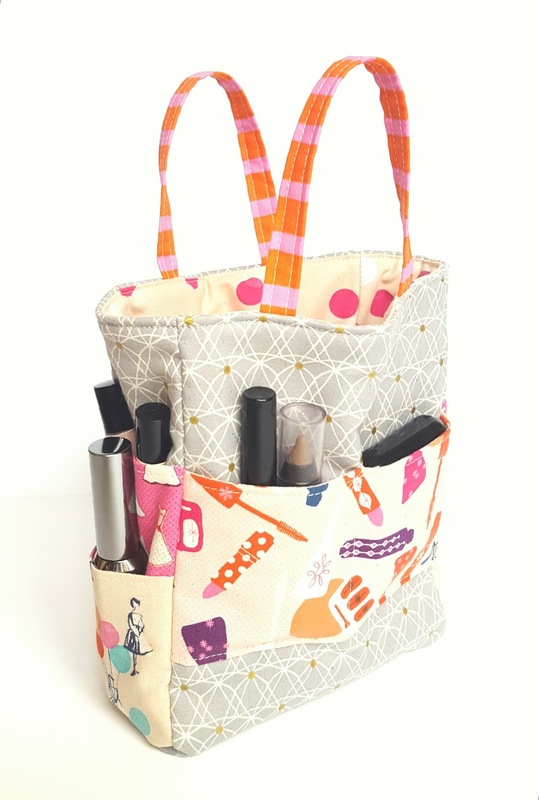 A miniature version of Virginia's Art Caddy Tote is absolutely perfect for the job. I followed the directions pretty closely, just trimming 3" off each measurement and eliminating the crayon pockets which I didn't need for this version. 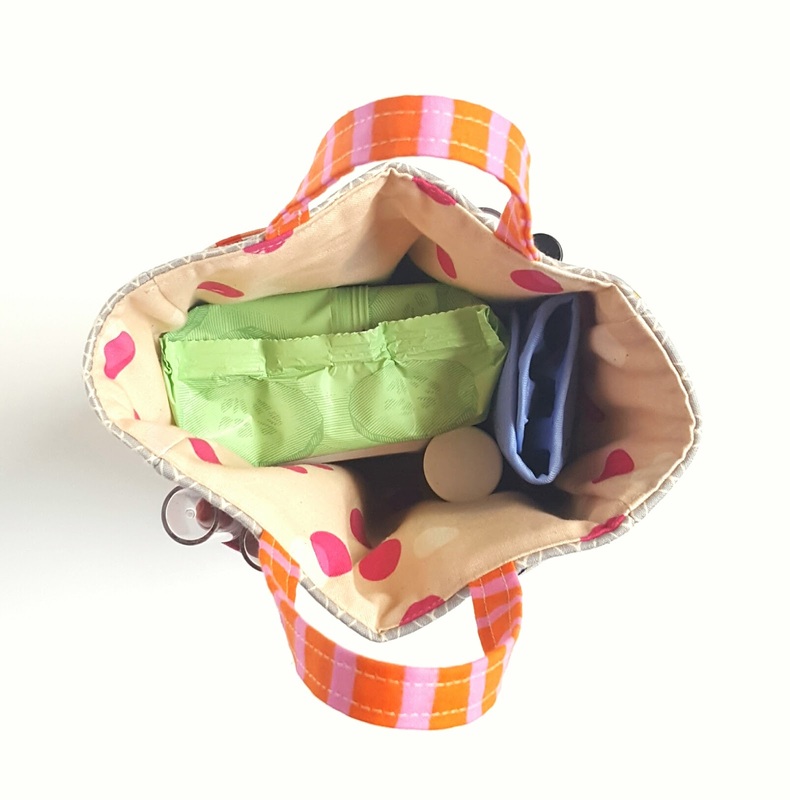 Because the bag was smaller, I didn't need the heavy interfacing that's required for the full size tote, just one layer of batting for the bag and some light interfacing for the widest pockets. It's a soft bag but still has plenty of structure to it, sitting up on my counter without any danger of falling over. I broke out my Quilt Market Sample Spree stash for this project, using Melody Miller's new Jubilee collection for Cotton + Steel, which couldn't be more perfect for a makeup bag. The only exceptions were the handles (a striped print from Wonderland by Rifle Paper Co.) and the bottom of the bag (a floral canvas from Flower Shop by Alexia Abegg) -- both for Cotton + Steel as well. I love the color scheme for this project -- so happy and girly and retro! I was amazed at how quickly this tote came together. I cut the fabrics one evening and sewed it together the next. 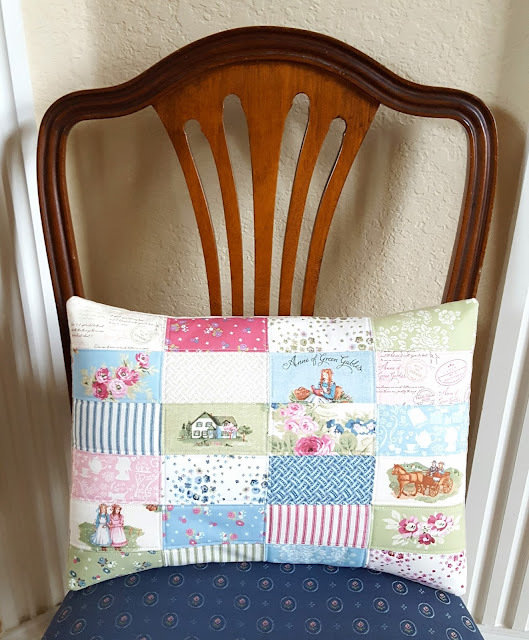 It's wonderful to think that I now have two projects in one with Virginia's pattern! The finished size of my miniature version is 6 x 7 1/2 x 2 1/2". It's so compact, but look how much fits inside! 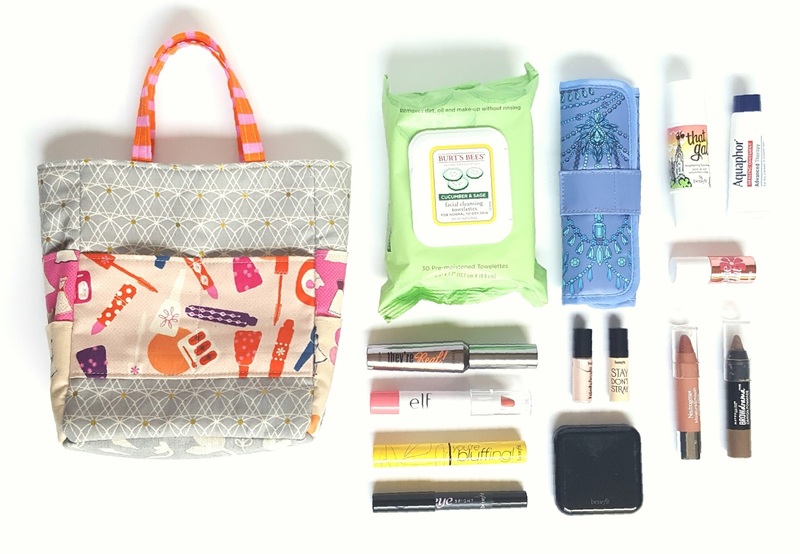 Not only does this keep all the clutter off my bathroom counter, but I feel like I'm all packed and ready to go the next time we take a trip! 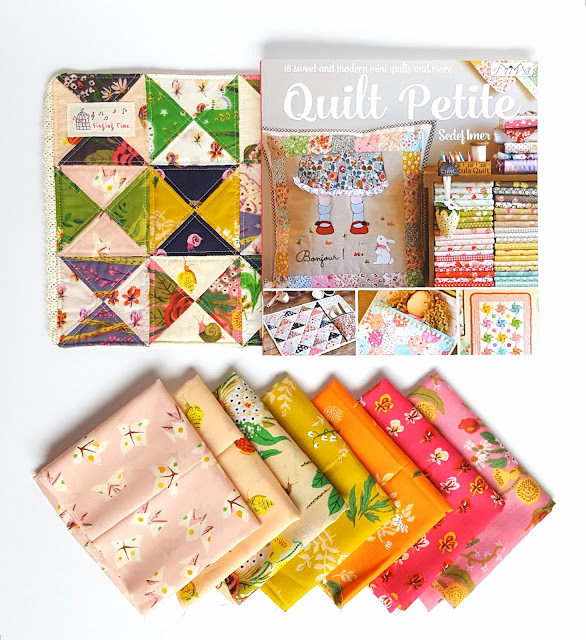 I have a wonderful book to share with you today: Quilt Petite by Sedef Imer for Tuva Publishing. You all know how much I love a quick project, and when you throw in colorful patchwork...well, that's all I need. 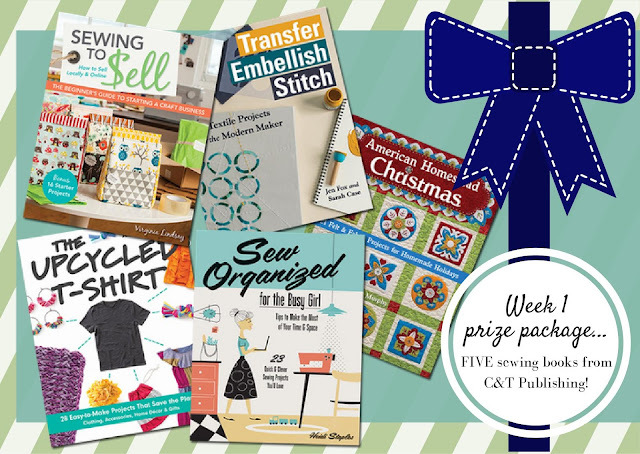 This book is full of darling little projects that are easy to sew in a day or two. For my post, I chose the Vintage Floral Mug Rugs. The original project directions actually make 2 rugs, while giving you optional instructions for making just 1 as I did. Sedef's versions are even scrappier than mine and look so fantastic. I used Heather Ross's new Sleeping Porch collection, buttery soft lawns in a rainbow of colors. The shades were so intense, that I decided it would calm things down a bit to have a simple contrast between a saturated and low volume print in each block. I quilted the piece 1/8" from either side of every seam. The mug rug is backed in linen, edged in crocheted lace, and accented with a label made from a piece of twill tape. It's always those little extras that make things even more fun! This was such a fun project, and there are so many others like it in the book. 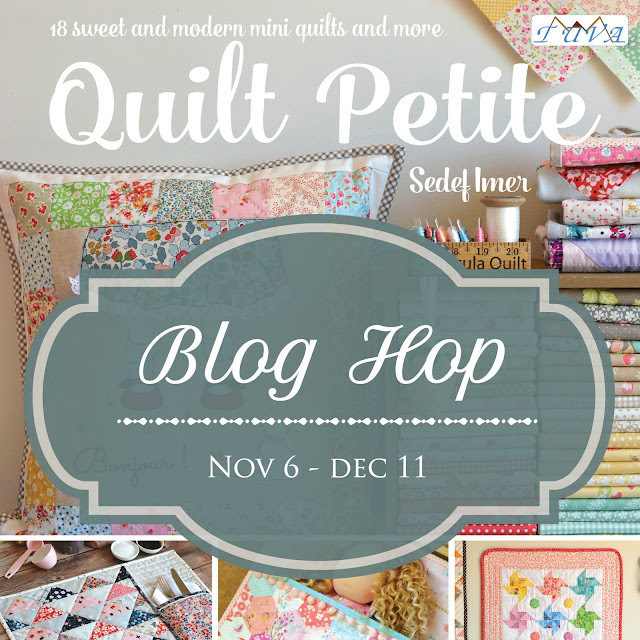 The Hexie Doll Quilt and Nine Patch Mini Quilt are calling my name already. There are a ton of talented people on the Quilt Petite Blog Tour as you can see below. Be sure to also stop by Sedef's blog for a fabulous giveaway! I vividly remember when Anne of Green Gables first premiered on the Disney channel in 1985. The Disney channel was completely different back then, featuring old cartoons, classic family movies, and episodes of the original Mickey Mouse club, all of which I adored. They showed that first Anne movie in several installments, and I waited breathlessly for each one to arrive. I had already enjoyed the book and fell even more in love with the movie, which I watched constantly after it came out on video. I showed it to my daughters for the first time over a year ago, and they were enchanted. Is there anything so wonderful as watching your children be delighted by the same things you loved as a child? 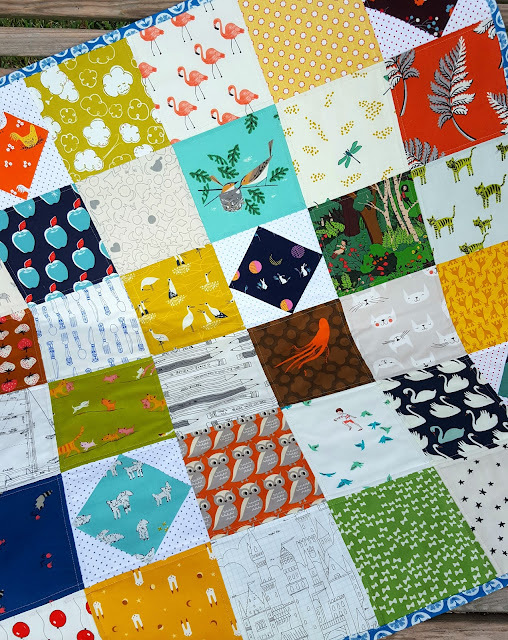 So when I was asked to join in the blog tour for an upcoming collection of Anne of Green Gables fabric, I just couldn't say no. They asked us to feature small projects, and though I had originally planned to make a Stationery Kit from my tutorial, circumstances stepped in to change things. My next door neighbor had surgery on her collarbone last Thursday, and I wanted to make her a get well present to go along with the dinner I was bringing for her family that night. I've had several friends over the years who have had upper body surgery on arms or shoulders, and the gift they always love most is a handmade rectangular pillow to use while they recover. I knew this fabric would be just my neighbor's style with it's sweet vintage look, so I spent last Thursday afternoon running up and down the stairs between my kitchen and loft, cooking enchiladas, baking molasses cookies, and stitching up a pillow cover. There are so many lovely prints in this collection. I like the florals and ticking stripes best, though I also love the illustration and text prints. Really, how can you choose a favorite? 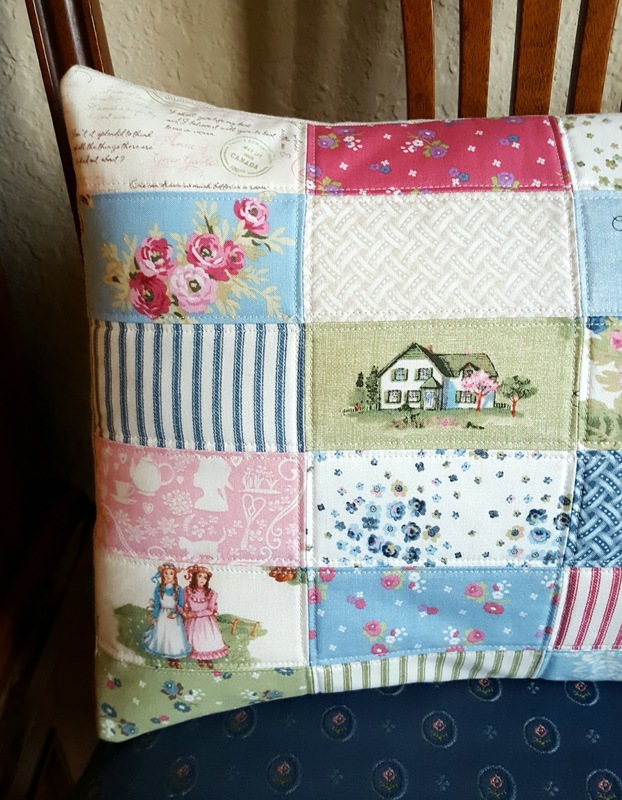 I mixed them all together for a simple patchwork cover using small rectangles that are quilted on either side of the seams. The pillow is backed in linen for a more rustic look. It will fit perfectly in my neighbor's beautiful home which is decorated in all the trappings of glorious Southern charm. Be sure to stop by the other blogs on the tour. Lauren's post yesterday is absolutely breathtaking, as she finished not one but three stunning projects with this collection! We found out that Bunny was on the way when my husband and I were really still newlyweds, married only six months. James had been hoping for a girl (I thought that was the sweetest thing! ), and we were thrilled to discover a few months later that we were expecting a daughter. It was all new to me. I had been a youth worker and then an elementary teacher for years, but I had never spent any time at all around babies. We walked through this new adventure of doctor visits, childbirth classes, and nursery shopping with both excitement and nervousness. What were we in for? Everyone had advice to share with us, and we were constantly trying to take it all in, not knowing what to expect. I will never forget my first baby shower, thrown by the sweet (mostly elderly) ladies at our little church in California where my dad was the pastor for over a decade. I sat down that afternoon and opened package after package containing gifts made by the hands of those dear women. My little Bunny started life with a stack of crocheted blankets, a nine-patch quilt, even an intricately crocheted Christmas stocking. Hours of time and love were poured into those gifts for my baby, and I was so deeply touched. I often told friends that my daughter (and Bear and Mouse to follow) were blessed with dozens of "grandparents" during those early years, and truly those wonderful people couldn't have loved my daughters more if they were their own flesh and blood. There is something special about sewing for babies. It's not just giving a personal gift of love to the new parents or even creating something to help fill a baby's nursery. I'm always so aware that what I'm making might end up being an important part of this child's life, a "lovey" that never leaves a toddler's side or a quilt that the he or she snuggles beneath every night. 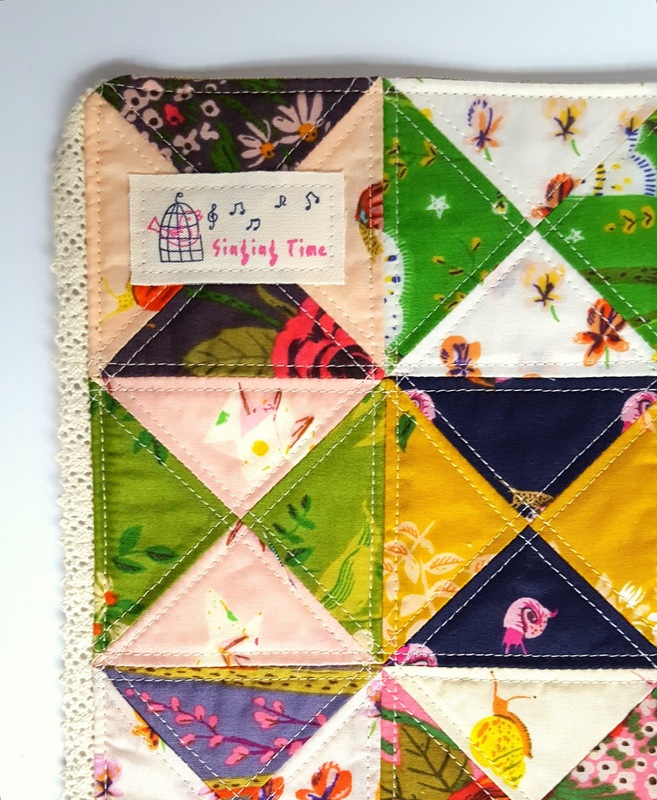 For instance, that nine-patch quilt I mentioned above was used by each of my daughters, but little Mouse became particularly attached to it. 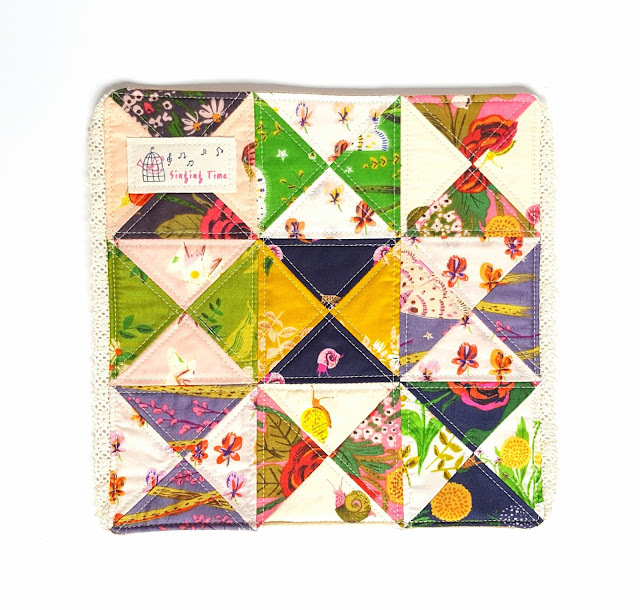 To this day she can't sleep at night without "Flowery" curled up beside her (she named it after the floral prints that the quilter used). In fact, my little six year-old-is in tears every time her quilted friend has to take a trip through the washing machine, waiting desperately for it to come out of the dryer so that I can once again wrap her up in that familiar, comforting warmth. Flowery is starting to show some wear, and though I've had to mend it several times over the years, Mouse wouldn't part with it for anything. I have no doubt that she'll be showing it to her children someday. So when I heard that my brother-in-law and his wife were expecting a son in early October, I immediately knew that I wanted -- needed -- to make a quilt for our new nephew. My good intentions got the quilt started several weeks before his due date, but other deadlines and responsibilities kept me from finishing it until this week. 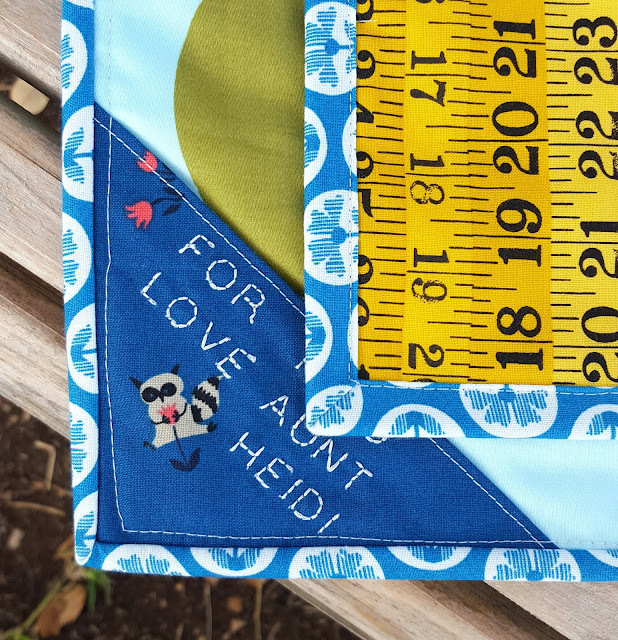 I'm so used to sewing for girls that it was a challenge to make a quilt for a boy. I wanted to be sure that the fabrics and colors I used would be a good fit, and I wanted it to be interesting enough that he would enjoy it as he got older. Out came the animals and the birds and all the fun children's prints I've been saving for kid friendly projects like this one. I even was able to sneak in a few prints from my Sample Spree goodies at Quilt Market last weekend. I've noticed a natural progression with each of my daughters and their quilts: play mat for the baby, blanket for the toddler, and friend for the preschooler. 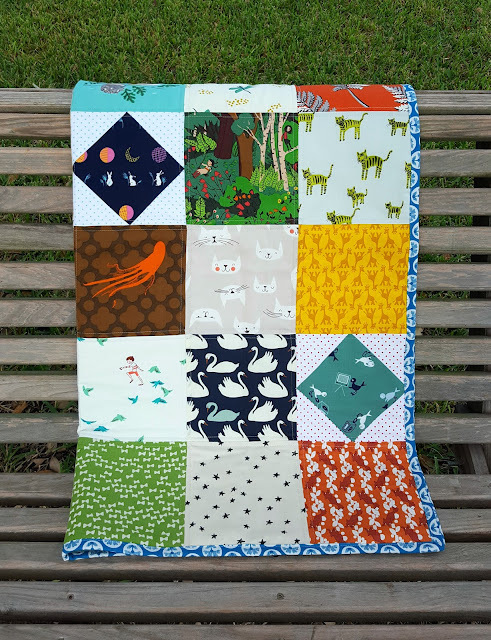 Because of this, I like to make baby quilts on the small side so that a young child will be able to carry it around without it being too large to handle easily. The pattern is pretty typical for me: simple squares, alternating low volume and saturated prints, with a few squares on point mixed in for interest. I quilted straight lines 1/4" on either side of the piecing lines. 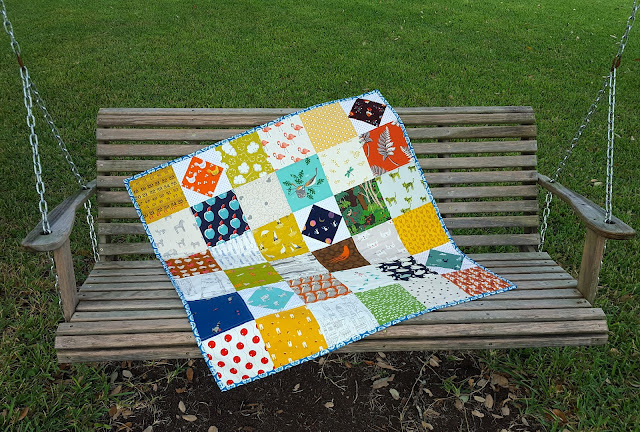 The quilt is backed in one of Tula Pink's amazing Free Fall wideback prints, and I bound it in a turquoise print from Anna Maria Horner's True Colors line. This is the very first quilt for which I can ever remember making a label, and I will try to do it more often in the future. Using the letter embroidery feature on my Singer made things a lot simpler. 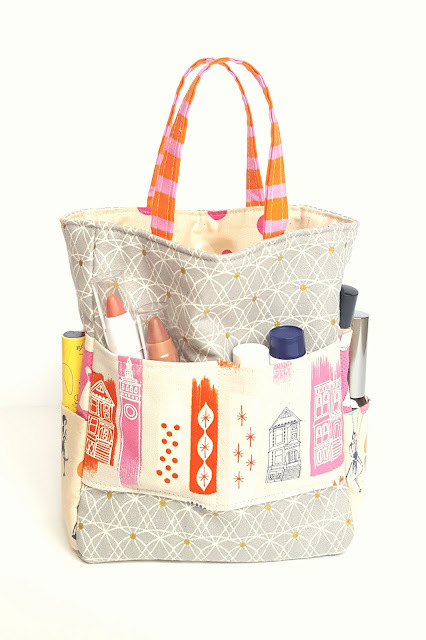 I also really love that little raccoon from Kim Kight's adorable new Yours Truly collection. I mailed the package off to our nephew last night along with three flannel burp clothes, each sewn by one of my daughters for their new cousin. They were so excited and proud to contribute a gift that they had made themselves, and I'm so thrilled to see their joy in that making. As I watch my brother-in-law and his wife start down the road that we began so nervously almost ten years ago now, it's amazing to me how far we've come. My little babies are growing up into capable young women, creative and sensitive, diligent and curious. It takes a lifetime to see the final legacy of all the values that we hope to instill in our children, but every now and then, I feel like we get a little peek at what the end result will look like. I just couldn't be more proud of them.